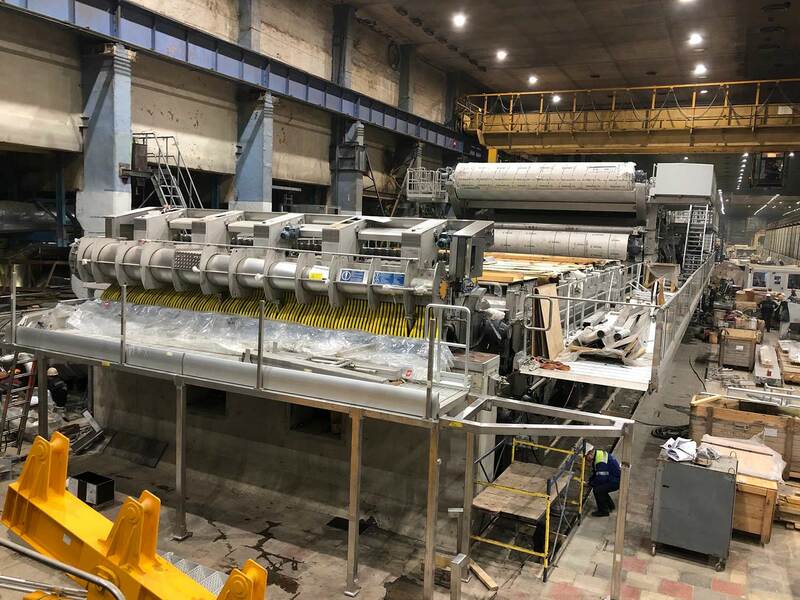 The main equipment of board machine-2 (BM-2) has been installed at Board Production Plant of Arkhangelsk PPM JSC. All parts of modularities of a new machine are assembled. Now the installation of communication lines is in progress for main and auxiliary machine parts. The BM-2 rebuilt works are being performed day and night. There are 12 specialists from Valmet at site. Close upon 400 workers from contractor companies, as well as employees of APPM are involved in this work. As reported by Mill Development Department management of APPM, the electrification and automation of BM-2 will be completed by the middle of April and then the commissioning will be started. 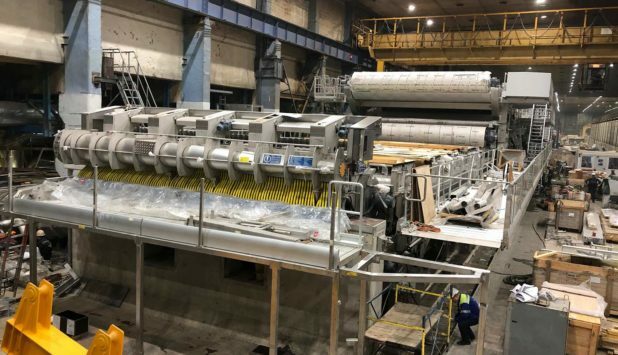 Installation of Valmet power-efficient equipment will allow decreasing the load on environment for water consumption and water discharge, energy resources consumption. Reduction of electrical energy will be approximately 5%, mill water consumption – 12%. BM-2 will produce fluting and kraft-liner. Such product as universal board Unilier earlier produced on this machine will not be produced anymore. After total re-equipping the machine will increase the capacity approx. up to 300 thousands of tones per year (growth of container board output at APPM will be 100 thousands of tones per year or 20%). Implementation of the second stage of APPM top investment project in the area of forest exploitation “Board production rebuilt” will give an opportunity to company to produce more than 600 thousands of tones of container board per year. Now therefore Arkhangelsk PPM JSC can offer the products of updated BM-2 with new features – extended density range (from 80 to 280 g/m2), new qualitative values, new opportunities for operational planning for both Russian and foreign markets.